While Obama might be having a hell of a time trying to reform healthcare, we perhaps shouldn't worry too much—because IBM's supercomputer Watson is now being used to fix America's shortage of doctors. Watson has had plenty of jobs along the way: as a pastry chef, on Wall Street, and even just answering phones. 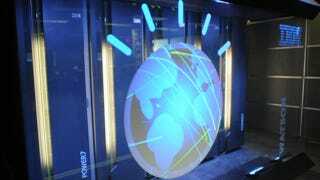 But for the past year the team behind Watson has been honing its medical skills, having it scan exam books to learn the basic principles of diagnosis, so that it can make sense of the data held in electronic health records. The system has already been trialled on the business side of Sloan-Kettering hospital—mainly because there are fewer litigation threats in that environment. But the supercomputer is now going to be unleashed on the Cleveland Clinic. Over the course of three years, the goal is to have the computer trawl patient records, point doctors to important data and perhaps even have it diagnose people. "I've had a couple of patients where Watson found things that I had missed. It doesn't work every time, but it's getting better."